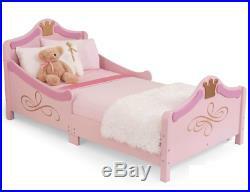 Pink Princess Toddler Bed Frame with Headboard. 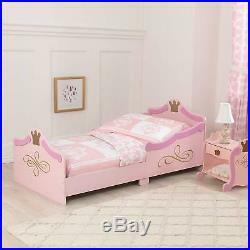 This Princess Toddler Bed will add a touch of royal elegance to your kid's room. Rich pink tones with gold filigree and crown flourishes will transform any bedroom into a royal palace. The integrated side rails protects your child from bed time tumbles. Takes a standard 140x70cm cot bed mattresses (not included). Low enough to the ground approx. 25cm to allow easy access for kids. Makes the transition from a crib to a regular bed as painless as possible. Adorable crown and gold leaf details. L 145 x W 75 x H 77 cm. Just write us your desired quantity and we'll customise an offer for you. The item "Pink Princess Children's Kids Toddler Junior Girls Wooden Bed Frame Headboard" is in sale since Tuesday, March 26, 2019.